Swipe left or right to scroll. ^ indicate low precision; no estimate reported. Past information on many drugs of abuse is available on our Archives site. Clinical trials are research studies in human volunteers conducted to answer specific health questions. Learn about the NIH-sponsored clinical trials available to you. NIDA Clinical Trial Locator - answer a few simple questions and get contact information for Clinical Trials near you. NIH Clinical Trials and You - NIH site that helps explain about clinical trials and why people participate. NIDA Trials at ClinicalTrials.gov - a resource of federally and privately supported clinical trials. Clinical Research Studies from the National Drug Abuse Treatment Clinical Trials Network (CTN) - a NIDA coordinated network of research institutions conducting human trials on drug abuse solutions. Research Studies at NIDA Intramural Research Program - located in Baltimore, Maryland. NIDA. "MDMA (Ecstasy/Molly)." National Institute on Drug Abuse, , https://www.drugabuse.gov/drugs-abuse/mdma-ecstasymolly. NIDA. MDMA (Ecstasy/Molly). National Institute on Drug Abuse website. 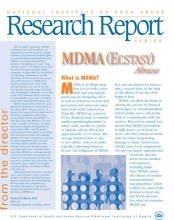 https://www.drugabuse.gov/drugs-abuse/mdma-ecstasymolly. . Describes the science behind MDMA (ecstasy) abuse, including what it does to the brain, whether it is addictive, and the latest research regarding prevention and treatment of MDMA.